A view from the upper deck of the new Islay ferry MV Finlaggan, taken on a cloudy crossing during her first year of service. Unfortunately the Finlaggan has one “problem” for me, which is very limited space outside. There is a small walk (without benches) below the bridge and the main outdoor areas are two small seating areas at the stern of the ship (one of which is taken up by the smokers). Apart from that you can walk a tiny bit on the starboard side (from where this picture was taken) and that’s it. Not a lot if you like to be outside if the weather permits it in any way. 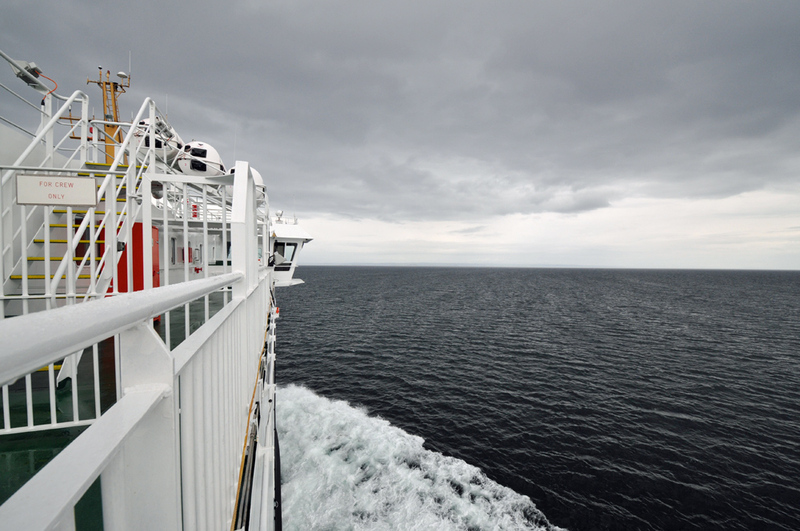 This entry was posted in Cloudy Weather, Mainland journey, Repost and tagged ferry, MV Finlaggan by Armin Grewe. Bookmark the permalink.